The Surfers Code is a set of universal rules to follow that will help both you and those around you maximise your ‘stoke’ in the water. Surfing can be one of the most enjoyable and addictive sport past times in the world. Like any sports in the world today Surfing has rules and unspoken etiquette to be followed by all. Out in the surf the person closest to the breaking face of the wave has priority -it is their wave to surf. The correct etiquette is to sit in the line-up, and wait your turn. Paddling around a surfer in the line up to get the wave ‘Snaking’, or launching yourself into their wave ‘Dropping In’ is definitely not on. Not only can it be dangerous, but it will create some bad vibes in the line up and possibly result in you getting chased out of the surf. Don’t paddle straight out through the line-up where the waves are breaking and other people are surfing. Try to find a rip/current/or shoulder where you can safely paddle out and not interfere with other peoples waves. When ‘splitting the peak’ with another surfer, be sure to communicate and let them know which way you are going. Take some time in smaller surf to learn the technique of how to duck dive under waves. Throwing your board is dangerous to those surfers around you and could cause serious injury. Remember at Manly, North Steyne and Queenscliff beach surfers are not allowed to surf between the red and yellow flags. Most importantly have fun! The best surfer out there is the one having the most fun. 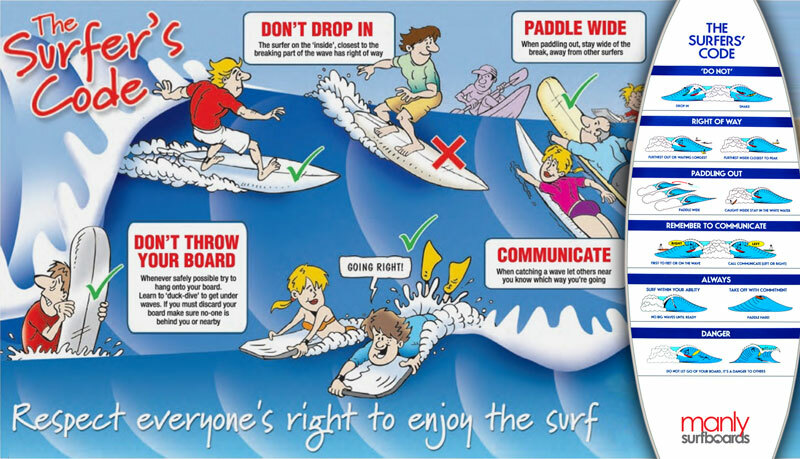 And remember as surfers we are always learning on our journey, so please keep the surfers code in mind the next time you paddle out.